Developing model train scenery has to start with the process of making terrain. This would include not only mountains, valleys, cliffs, riverbeds and gorges, but also meadows, fields, undulating landscapes and any other land form that you could imagine. This is one of the older methods of creating contour for your model train scenery, but still works and is fairly inexpensive, especially if you have some old screening material or chicken wire or any other similar malleable material lying around the house. You can cut the material in sections so that it’s easier to work with. Then staple or glue the bottom edge to the subroadbed. The top edge should be folded under and attached to the wall or backdrop in such a way that the screen comes to a peak then begins dipping down behind itself before it’s attached. This way it won’t look like your trees are climbing your wall when you’re finished. The screen can be shaped in any way that you want to form an undulating meadow, irregular hills and valleys, or tall mountains. You may need to use pieces of wood or Styrofoam or wadded up newspaper underneath the screen in order to prop it up securely in some areas. Make sure that no metal parts of the screen or wire mesh come into contact with the rails of your track after you have finished fastening it down. Then take plaster cloth (which is a gauze material coated with dry plaster; it’s usually readily available at hobby shops) and cut several 6 or 8 inch lengths so that it’s easy to work with. Take one strip of the plaster cloth and place it in a flat pan of water for a few seconds, just enough time to soak the cloth. Then pull the cloth out of the water by holding it at 2 corners and pulling in out as a sheet. Then place the sheet of soaked plaster cloth on the screen form starting at the top and cover over a section of the screen with the cloth. The next piece of plaster cloth should be applied in a similar fashion overlapping the first sheet. Continue to do this till you can’t see any of the screen or wire material any more. If you don’t have any plaster cloth you can use regular paper towels soaked in a soupy mixture of plaster or Hydrocal (which is a lighter form of plaster that you can get at hobby stores). If you don’t want to use plaster at all you can use stiff paper towels and glue them on the surface of the screen using a paintbrush and a container of liquid glue. This method of beginning your model train scenery requires an old cardboard box and some heavy-duty scissors or a good box-cutter knife. You will need to cut many one-inch wide strips of cardboard in varying lengths depending on the size of your layout and how high you want your mountains to be. Then start attaching the strips to the subroadbed by folding the very bottom of the strip underneath itself and attaching the fold to the subroadbed. Use the same technique on the top of the strip, folding the top of the strip underneath and attaching the folded-under portion to the wall or backdrop. Place the next strip about 1-2 inches to the side of the first and do the same thing. After you get several strips in place, then take another length of cardboard strip and glue or staple it horizontally across the vertical strips. Keep doing this with several more strips until you end up with a lattice or web of cardboard strips. You can adjust the height and shape of this web in various places to create the effect of mountains and valleys. After you have formed and shaped your latticework of cardboard strips, you can then apply the plaster cloth or paper towels soaked with plaster as described above. I like this method the best. I got this from a Woodland Scenics book on model train scenery. Just wad up some old newspapers – one half sheet at a time - in such a way as to make each wad have a somewhat rounded top and irregular bottom. Then start stacking these wads on top of each other, holding them in place with masking tape. 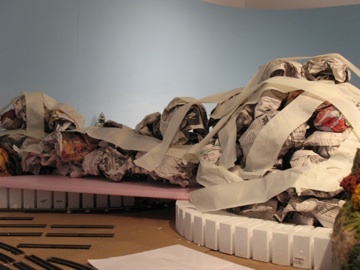 After you have stacked a few of the wads in the shape of a hill or mountain, you can then get out the plaster cloth and lay sheets of the soaked cloth on the surface of the mountain, layering them so that none of the newspaper is visible underneath. If you have used extruded foam sheets for your subroadbed, you already know how easy this is to cut and shape. 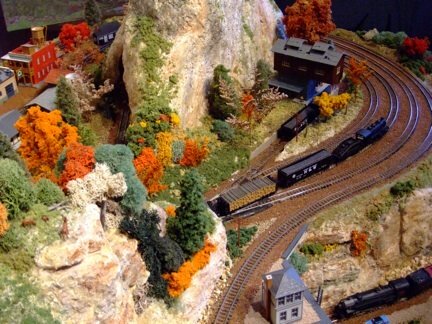 This is a great material for adding landforms to your model train scenery. If you want to make a mountain, start by cutting out the general shape of the base of your mountain according to where you are going to put it on your layout. Use this as a template to draw the shape on another sheet of foam. Then cut out the second form so that it's about an inch smaller in size than the first one. Then use the second form as a template for the third on and so on, making each new form a little smaller in size than the one before it. Soon, you will be able to stack these forms in the shape of a mountain using progressively smaller forms on top of the larger ones. You can then further "shape" your mountain by moving the forms around a little on top of each other and by cutting off edges of some of the forms, such that eventually you end up with the general shape that you want. Then glue the sheets together using Liquid Nails. You can then use a hot knife to trim the unwanted upper edges of the foam sheets in order to smooth out the sides of your mountain and also create crevices or indentations to further enhance the shape. You may want to cut out the places where you want to install rocks or rock formations. When you're finished creating your mountainous shape, then cover it with plastercloth using the method described above. This is necessary for the surface to be textured properly so that it will conform to the rest of your layout; and it will be easier to paint it and apply ground cover properly. Plus, you don't want to have pink or blue foam peeking through your model train scenery! Another method of creating cliffs, rock walls and mountainous terrain is to break up old ceiling tiles and stack them up so that the rough broken edges are lined up to look like a cliff or rock wall. You will have to do a little shaping and breaking off edges to get it to look right. Then glue the layers together. You can tilt the shape to make it look like layers of rock that have been disrupted by glaciers or b earthquakes. You may wish to paint or airbrush the edges with various rock-like colors. The top of the tiles will have to be disguised by other scenery or built up further with tapering layers of tile. You can buy cans of this product (actually called "Great Stuff") in hardware and building supply stores. It is meant to be used as an insulating material that you can spray into areas of your home that are hard to get to. The foam spray, after it is applied, expands and hardens into a foamy material that you can cut with a serrated blade or handsaw very easily. If you use this to create a mountain for your layout, remember that the material expands to about 2-3 times the size of the blob you spray out on the surface of your subroadbed. Also, once you’ve opened a can, and used it once, you can’t use it again later on another day. One more thing – don’t touch it or try to shape it while it’s still wet. You will just make a mess and won’t be happy with the result. You should wait till it dries and then shape it. After your mound of Great Stuff is dried and shaped the way you want it, you can then place the plaster cloth over it as described above. Once again, I like to do this step because the plaster cloth provides a better surface on which to paint and glue down your ground cover later. You can purchase this at hobby shops sold specifically for the purpose of making “Mountains in Minutes” as a way to develop contours, land forms, rock walls, etc. for your model train scenery. You have to pour one liquid into another in a paper cup then pour the material on your subroadbed where you want a hill or mountain. The instructions that come with the purchase are very good so they don’t need to be repeated here. The end result is again a hardened foamy material that you can shape with a knife or handsaw. If you just want some mild undulation of the surface as a base for your model train scenery, so your landscape isn’t totally flat (which it shouldn’t be to be realistic, unless you’re modeling in the city), you can just glue down some small flat rounded pieces of Styrofoam to your subroadbed positioned irregularly on the surface, then cover with plaster cloth. One thing to remember is that when you’re making landforms, meadows or other natural elements in a model scenery landscape, you don’t have to be perfect. In fact, it probably looks better and more realistic if you’re not too perfect while doing this. From "Model Railroad Scenery: Terrain" back to "Model Train Scenery"
From "Model Train Scenery: Terrain" to "Homepage"